There’s nothing like a nine month cycling expedition to strengthen the bond of any bromance. Nick Codrington and Laurence Gribble are two ordinary chaps from the UK who wanted to make a difference. Upon graduating from the University of Cambridge in July 2014, they set out on the charity trip of a lifetime. However, this was no ride in the park. 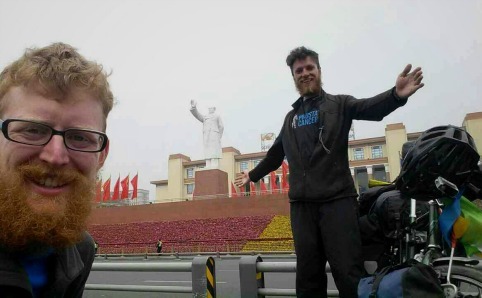 Codrington and Gribble went on a bum-numbing, 17,298km journey from London, England to Hong Kong. This expedition took them 262 days and they arrived at the top of The Peak on March 28, having raised $161,500 for Prostate Cancer UK. We sat down with the exceedingly exhausted duo after their arrival in Hong Kong to talk wolves, frostbite, being held at gunpoint and what it’s like having to take a 1,000km diversion. Hey guys. Why was Prostate Cancer UK your charity of choice? Laurence: We always wanted to do something for a cancer charity, because a lot of people are affected by it and one of my dads best friends passed away from prostate cancer. We thought it would be cool to get people talking about what men don’t normally talk about, and to be able to get guys to admit there’s an issue. 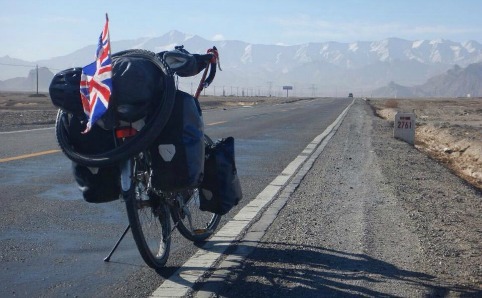 What went into planning your cycling expedition? Nick: Not much. We had a look at Google Maps and planned a route and looked into visas. But that was really the extent of our planning. Neither of us had ever cycled before. During your trip, did you ever have to change your route or plans? L: We said this trip was going to be 15,000km, but it ended up being 17,298km. We weren’t able to go through Iran, they changed their visa policies and it would have cost us $100-200 per day, and we would have been there for a month. Since that would have been quite expensive, we had to divert through Kazakhstan. 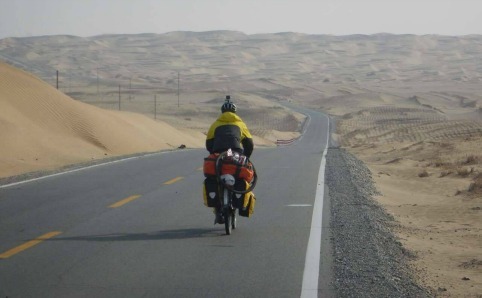 N: When we made this decision, we both just looked at each other and realised this would add an extra 1,000km of desert cycling to our journey. Can you tell us why you were held at gunpoint in Turkey? And what thoughts went through your head? N: We had just come across Europe where we camped in fields. Usually we would ask permission, but in Turkey, neither of us spoke Turkish, so we thought trying to explain would be difficult. There’s a lot of open area in Turkey, and if you set up your tent as the sun’s setting and take it up just before the sun rises, nobody even notices. L: We found an area where there were loads of fields and waited for it to get dark. We thought we were going to have a peaceful, early night, but then tractor lights shone on our tent and we heard a guy shouting a bit, he seemed kind of aggressive, so one of us had to go out. N: I drew the short end of the straw. I stepped out of the tent, and I said ‘Ingiliz,’ which is ‘English’ in Turkish. I then basically strung together the words that I did know which were, ‘Ingiliz,’ ‘bisiklet,’ (bicycle) and ‘turist’ (tourist). I put my hand up to the light, there was one man standing by the tractor and there were two others off to the side and I had looked over and saw they had hunting rifles pointed right at my chest. I immediately thought, ok, hands in the air, and just repeat those three words. All I could think was that we cycled so far and we had about another 10,000km to go and this could be the end of it. Then, after repeating those words, they put their guns down and I felt a sense of relief and then shouted to Laurence to come out. They ended up inviting us in for tea, but I thought no, I don’t really want to go in so we just said goodbye. Other than the guns, what was the most frightening thing that happened to each of you? N: I think for me, it was being approached by wolves. We had to split up for one day, because Laurance was starting to feel really bad. We had decided he would take transport to the next town and I would cycle. One of us always had to be cycling. So off I went at night to cycle to the next town. I was about 20km from the town and I could see shadows at the side of the road and then the wolves ran out in front of my torch, I should have kept going but I had stopped. There were two of them and they weren’t big like what you see on TV, they actually looked a bit like a big fox. But everyone had warned us about wolves the whole way through the mountains. The wolves were probably more afraid of me than I was of them and they eventually darted off after a short stare down. But as they ran off, they did a howl and that’s when I just got out of there. I did run into a few more one on one, but I just kept going, I thought I’m not stopping again. L: I was disappointed, I really wanted to see a wolf! But for me, I think the most frightening part of the trip was when I got superficial frostbite. 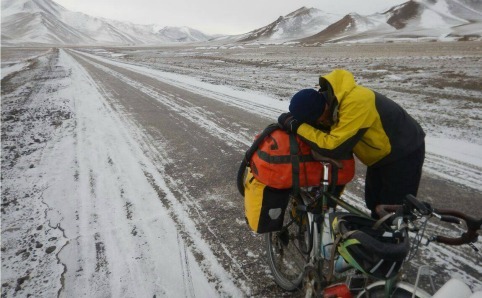 It started in Tajikistan and it was so cold, and you’re not really moving your hands while cycling, so my fingers would freeze really quickly, they turned a bit grey. At that altitude my frostbite didn’t get much better, it wasn’t until we had come down and about a week later that they got better. I was actually very quite worried. I had nightmares about losing fingers. What’s something that surprised you during this trip? N: How hospitable everyone was. It was really amazing because we were travelling through small towns in Afghanistan and everyone would stop and stare, not many people go through Afghanistan. I think they said the last time a foreigner went through was five years ago and everyone remembers him. The humbling thing was that people just took us in. People took us in all over, but in Afghanistan there wasn’t any electricity or running water. L: Ya, you get all of these so-called ‘dangerous countries,’ but we found they were actually the nicest (in terms of people). They said it was an honour to have Western guests in their area and they wanted to show that their area is safe, they’re nice people, and it’s just a small proportion of the country that has an issue. They were very hospitable, welcoming and gave us a little of whatever they could. One night in Afghanistan Nick was really ill, he was close to passing out from severe food poisoning. We saw a house and there were two random guys outside, we asked if there was somewhere we could sleep and rather than answering he took us to a shed that he had and set us up in there. He saw that Nick was ill and rather than staying with his family, he came and slept in the same room as us so he could help Nick. The loo was outside and every time we had to go, he would go with us to make sure we didn’t get attacked by wolves or fall off the cliff. 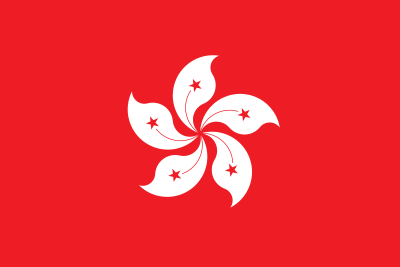 What is your impression of Hong Kong and how did it feel to arrive at The Peak after this incredible journey? L: I use to live in Guangzhou, so I had been here a few times before and I have stayed in Hong Kong for a couple of months before university. I knew what to expect from the city, but was excited to be back in civilization. N: I had never been to Hong Kong before, but I’ve heard a lot about it and how it’s such a metropolis. Arriving at The Peak, I was overcome with emotion. We had made it and it was also nice to be in a place with people and good food. If given the chance to do it all over, would you, and what would you do differently? N: I would definitely do it again, but I think it would be better to have more time to prepare. Even though we didn’t really prepare and nothing went wrong, it would have been nice to have time to get sponsorships. Oh and get better gloves! Find out more at journey-to-the-east.com.